These numbers are right in line with a pattern that for the past several months has plagued Google in which the company sheds a little bit of their shares while Bing edges up slightly. The good thing for Google is that these drops have usually only been fractions of a percentage point as opposed to the full point the company saw in January. The number of core searches tallied rose from 16.4 billion to 16.9 billion from December to January, a 3% increase. Google hit the number one spot with a total of 11.1 billion searches. 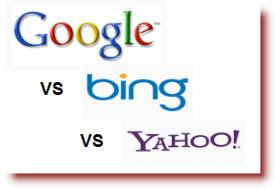 Yahoo came in second with 2.7 billion, followed by Bing who tallied only 2.2 billion. These numbers represent a 1% increase in January for Google, a 4% increase for Yahoo and a 13% increase for Bing. These figures are derived from explicit core searches. This just means search terms manually entered into the search bar. This data also takes into account all of a company's search sites. So, in Google's case, these results included searches on Google's main page and the ones on YouTube, Google News, Google Images, and other proprietaries. These numbers also include "powered by" searches. In January Google's number of "powered by" searches on its own sites and on AOL and Ask.com was 62.8%, whereas Bing searches on Microsoft and Yahoo reached 25.6%. This showed yet another loss pattern for Google as the company lost a small percentage of their "powered by" searches as well. While Google does remain in a commanding lead, Bing could slowly creep up and surpass Google as the leader of the search engine world. However, you do have to take into account the recent battle between Google and Bing where Bing was accused by Google of stealing search results. If proven guilty, this could have a serious effect on Bing and their search engine.